OK ….. as we bask in the afterglow of a great evening, I want to thank every one of you who attended the reunion. You are the people who make this happen every five years, you are the people who welcome and embrace each other ….. who dance together …… who laugh together …… and who helped me up from the floor after the KJHS picture. Huge thanks to Jim White for selling far more 50/50 tickets than I thought we would. Last night proved that it doesn’t matter a bit who we were 45 years ago …. we celebrated who we are right now, and we’re damn good at celebrating. Please keep on posting pictures and comments. 2020 will be here before we know it! Below is the most recent list of reunion attendees. Please add the “check’s in the mail” classmates — Marcia (Anderson) & Gary Agger, Mike Flaherty & guest, Doug Cole, Cammy (Dalfonso) Reali, Janet (Swett) & Bruce Chase. THERE IS STILL TIME TO RESPOND and to contact people whose names you don’t see listed here! That goal of 100 attendees is within our grasp! Ralph Cabana It’s actually not a bad count for a month away. We’re hoping for about 100 people, but there’s certainly room enough for more! Molly Bornstein I do not think I can make it this time. I have a family event that weekend… I will miss the fun. I did enjoy the 35th reunion. Send my regards. Renee Edelstein Ginny Hall you better go! I can’t wait to see you!! Carol Toroomian Molly it was great seeing you at the 35th but I can’t believe that was 10 yrs ago!! Scary thing time is lately. Carol Toroomian So glad you are coming Renee Edelstein even if for a short time. Renee Edelstein Thanks Carol! Looking forward to this one esp since reconnecting on Facebook!! Janice Sullivan Brad – very true. Carol Toroomian Jan and Brad. Let’s not get morbid!! Patt Murphy I’m looking forward to it!! Anita DiCrecchio Just dropped the check in the mail. Hope my East End class mates will do the same. So I will see you there. 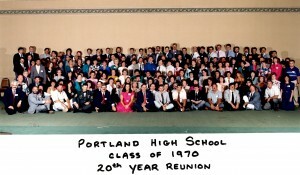 To all my PHS 1970 classmates…..just 4 weeks from Saturday until we gather to celebrate our 45th class reunion. For those of you who ARE planning to attend – I can’t wait to see you ( helped by my progressive lenses). To those who are still thinking about it….PLEASE decide to join us and relive the great and not-so-great moments from so long ago. The reunion committee has worked very long/hard in planning this party but your presence will make it truly memorable. Head counts will be needed before too long – so get those checks/reservations sent in and start the count down to July 18th. (off Congress St behind Shaws Westgate). The evening will begin at 6:00 with a social hour and a buffet dinner will follow at 7:00. Elmore Twist will be back to provide the musical entertainment – and, yes, those are our classmates Bill Bennett and Ed Croxford rocking away in the band! Tickets for our 45th year reunion are $55.00 per person and $110.00 per couple. You just know you’re not going to have the chance to talk with everyone you want to on Saturday, so we’re having a hearty breakfast buffet the following morning, Sunday, July 19 at 9AM, back at the Italian Heritage. We’ll need at least 50 attendees at the breakfast to make it happen – cost for this is $25 per person. We’ll keep you posted on Facebook as well as on our website, www.phs1970.com. That’s where you will find updates, messages and a list of our “missing” classmates (if you know the whereabouts of any of these folks, please contact Ralph Cabana). July 8. Then get ready for a wonderful weekend spent with old (literally AND figuratively) friends. Questions? Contact any of us listed below. Thanks and see you in July! 50/50 raffle tickets will be sold at the reunion to help fund our 50th reunion in 2020!